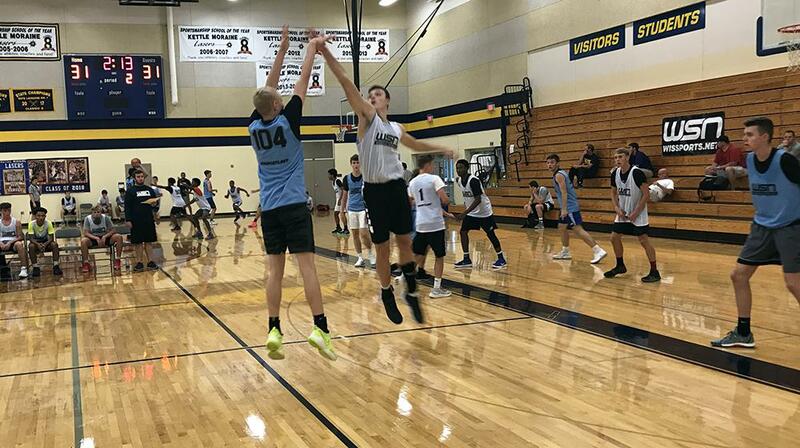 An entire afternoon spent in a gym is never a bad thing, and at Sunday's Wisconsin Sports Network Showcase held at Kettle Moraine High School, that most definitely was the case. More than 115 boys' basketball players from across the state took part in the event, which featured some of Wisconsin's top players in the classes of 2019, 2020, 2021 and 2022. Whether he was scoring from well beyond the three-point arc or using his quick first step to get around defenders and finish through contact at the rim, Klesmit was more than a handful for opponents to handle. He scored at a very high level and made some clutch plays down in the stretch to help his team to a come-from-behind victory in one contest. Klesmit is a returning second-team all-Fox Valley Association performer for coach Lee Rabas at Neenah, and seems poised to increase his scoring output of 14.1 ppg of a year ago. Jenkins has the versatility and skill package to play either guard spot, but he mostly played point guard Sunday. He has a steady pace to his game and uses his vision, physical strength and shooting/passing abilities to make things tough on opponents. A three-year varsity performer for coach Brad Bestor at Kettle Moraine, Jenkins is one of the state's top class of 2019 prospects and a potential scholarship player. Intelligent and very skilled point guard who has blossomed over the past six months into one of the state's better class of 2019 lead-guard prospects. Gouin makes smart basketball players, can drill shots from the perimeter and is an unselfish player who anticipates openings for his teammates and delivers accurate passes. After averaging 9.5 points for an Arrowhead squad that went 18-7 under coach Craig Haase as a junior, Gouin and junior wing Carter Gilmore (6-7) should form one of the better duos in the highly competitive Classic Eight Conference in 2018-19. There is a ton to like about Huibregtse's game. He competes with an edge, possesses an extremely high basketball IQ, can make plays through contact thanks to his physical strength, and has very little wasted motion when making plays for himself and his teammates. He has the size, strength and skill to be an effective lead guard and makes outstanding decisions with the ball in his hands. After averaging 15.5 ppg as a sophomore starter for Grafton, Huibregtse again figures to team with sophomore Bryson Clague (6-2) in a very talented backcourt for coach Damon James. Larson simply has a nose for the basket. He can make three-point shots and score in transition, but his biggest assets might be his timing on offensive rebounds and his ability to see the court and deliver accurate passes. A three-year starter for the varsity squad at Fennimore, Larson has good size and strength to go along with stellar leadership skills. A first-team all-league choice in the Southwestern Wisconsin Activities League in each of the past three seasons, Larson enters his senior year with 1,198 career points after averaging 18.8 ppg as a junior. After playing on the freshmen squad at Muskego a year ago, Podziemski opted to transfer to St. John's Military over the summer and showed at the WSN Showcase he will be an impact player from the get-go for the Lancers. A left-handed wing player with excellent jumping ability, Podziemski scored well from outside the arc, off drives to the basket and off pull-up jump shots. He also defended at a high level and had several steals he converted into points in one victory for his squad, which went on to win the WSN Showcase championship. It's hard to be a breakout performer when you have the solid reputation Palesse possessed prior to taking part in the WSN Showcase. However, his ability to play either guard position was on full display at Kettle Moraine and he was effective in both spots. In fact, that's the thing that stood out most about Palesse. His versatility and ability to impact the game on so many different levels was not lost on the many college coaches attending the event. Palesse already is ranked among the top class of 2021 prospects in the state, and his showing Sunday most certainly cemented that status. Coming off an ACL injury, Brickner said he played at about 75 to 80 percent at the WSN Showcase. However, his performance was nonetheless highly impressive. His length, size, defense, athleticism and skill were equally impressive. Brickner played just four games last season due to the injury, but he averaged 9.4 ppg as a sophomore. Look for a huge season from Brickner and Freedom in 2018-19. From the opening tip of the first game until the final buzzer of his final game, Kartes was aggressive on offense. And the results were usually positive for his team as Kartes consistently drilled three-point shots while also getting to the basket and scoring off the bounce. A returning second-team all-City Conference performer who averaged 13.3 ppg for coach Doug Lewis, Kartes is one of four returning starters for a King squad many expect to contend for the City Conference title. Like Palesse, Melvin had a very solid reputation among class of 2021 prospects in the state prior to the WSN Showcase. And also like Palesse, Melvin managed to increase his stock with stellar play at Kettle Moraine. A very good shooter with good physical strength and the ability to attack the basket, Melvin did an excellent job of spotting up from three-point range and making shots while also mixing things up on the boards on both ends of the court. Melvin competes with high energy and rarely takes a play off, traits that will help him going forward with an improved program at Hartford. Platz hunted his long-distance shots as well as any other player in the WSN Showcase, and when he was given an opening, he came through with one splash after another from deep. The returning honorable mention all-league pick in the Greater Metro Conference averaged 11.6 points and 3.8 rebounds for coach Casey Kowalewski at Marquette HIgh as a junior starter and will be a guy opponents must cover at all times because of his accuracy from deep and his ability to get off his shot quickly. Ellingson is a guy you really root for since he's had to overcome several injuries during his prep career. He appeared to be back at almost full strength at the WSN Showcase, and he did a very good job knocking down open three-point shots. He also was willing to use ball fakes to get around defenders and take the ball to the basket. The younger brother of former Sussex Hamilton star Brady Ellingson, Ty Ellingson averaged 7.6 ppg in 10 games for the Chargers last winter. Coach Andy Cerroni's loaded program could benefit greatly with a healthy Ellingson back in the lineup this season. A smooth-shooting combination guard who is valuable with or without the ball in his hands, Dopirak is one of the state's secrets in that not many realize just how good a player he has become over the past year. An honorable mention all-Fox River Classic Conference player as a freshman for coach Thadd Cornell at Manitowoc, Dopirak did not need a lot of time to line up his outside shots and the result was usually money. He averaged 11.0 ppg as a freshman and appears poised to increase that output as a sophomore. Wilder was on fire at times on Sunday from the perimeter, helping his squad to several victories. He shot the ball exceptionally well and also did a good job of playing defense and sharing the ball with his talented teammates. Wilder made five three-point shots in one game and three in another game. It's tough getting recognition when your team fails to win a game, but Brown has managed to keep his name in front of college coaches with a solid summer that extended into a very good showing at the WSN Showcase. One of five returning starters for coach Alex Olson at Milton, Brown has a quick trigger from outside the three-point arc and has evolved into a very accurate shooter. He is a player opponent's must account for at all times because of his ability to get open and make shots. Millard competed on the JV squad at Wisconsin Dells last season, but he appears ready to take on a major role for coach Brad Rohling and the Chiefs over the next two seasons. He played with lots of energy at Kettle Moraine, and was able to score with his length and hustle. Millard needs to add muscle and strength to his long frame, but his future looks bright as he made a ton of big plays at the WSN Showcase. Skelly is relatively new to the game, but each time out he seems to get better. He did an excellent job on Sunday of running rim to rim and affecting the game on both ends of the court. A starter for coach Rishon Haralson at Bradley Tech a year ago, Skelly will play a prominent role for perhaps the most improved team in the City Conference in 2018-19. Ognacevic appears to have gained some muscle and weight since July, and that helped him hold his ground in the post. A versatile forward who can play away from the basket or in the lane, Ognacevic owns a great up-and-under move that usually leads to two points and often to conventional three-point plays. His work ethic, size, skill and length are all positive attributes for a Sheboygan Lutheran program expected to challenge for the WIAA Division 5 state title. Hard-working, versatile big who is coming into his own heading into his senior season. Came off the bench for coach Travis Moulton at Watertown a year ago and averaged 6.0 points and 3.2 rebounds for a club that went 11-12. He figures to move into the starting rotation this time around and will be a handful for opponents to handle because of his energy, desire and ability to score in different ways while also rebounding on both ends of the court. Claflin probably projects to a small forward for the next level, but he played in the post most of the day Sunday and more than held his own. An athletic player with very good size and solid basketball instincts, Claflin rebounded well, scored from mid range and in the lane, and defended with energy and desire. Claflin, who averaged 11.0 points and 5.2 rebounds as a sophomore, is one of four returning starters for Southern Door, which went 20-5 a year ago under coach Derik Hawkey. Length, size and skill are coveted in basketball and Dailey has all three. He has a very long wingspan, plays on the perimeter at 6-foot-5 and can make shots from deep and off the dribble. As a freshman, Dailey led Mineral Point in scoring (21.3 ppg) and finished third in rebounding (5.5 rpg). He is one of four starters back from a 21-5 squad for Dan Burreson, and teams with junior Isaac Lindsey (6-3) to give the Pointers two legitimate NCAA Division I prospects. Waukesha West is loaded for 2018-19 and a guy like Ziebell, who made shots, played with confidence and defended well, is proof coach Don LaValle's squad is a legitimate contender for the WIAA Division 1 title. Ziebell likely will come off the bench to provide energy and offensive punch for the Wolverines, who return four starters, including 6-foot-10 senior David Skogman, one of the state's top collegiate prospects. Ziebell's energy, focus and ability to make three-point shots could greatly aid Waukesha West this winter. Already a starter for Oak Creek as a freshman, Sinani made one excellent pass after another at the WSN Showcase. He also flashed his ability to score in different ways. A point guard with very good size and the ability to see others on the court, Sinani will be a corner piece to coach Kyle Johnsen's rebuilding project at Oak Creek. Active, athletic and aggressive wing forward who got to the basket and was able to finish at times at the WSN Showcase. Started at Cedarburg as a freshman and averaged 7.8 ppg. Good basketball build to go along with high energy and very good jumping, running ability. A key player on the JV team at Wauwatosa West as a freshman, Hinson could work his way into the playing rotation for a very deep and talented squad as a sophomore. Coach Marc Mitchell has five starters and five reserves back from a club that went 11-14. He also added Dominican transfer Abe Scruggs IV. So playing time will be tough to come by, but Hinson's versatility, size and athleticism were all very impressive and could earn him some playing time. No player came close to saving as many possessions or getting on the ground for a loose ball than Baackes, who had more floor burns that shot attempts over the course of the day. How many players can say that? Baackes is aggressive with the ball in his hands and, at times, forces the issue a bit. But his energy, desire and ability to rebound and save possessions were all highly impressive. This is a guy opponents will not relish the opportunity to compete against. A very strong, athletic and determined player who never takes a play off, Finnessy competed hard against taller opponents most of the day and more than held his own. He ran the court, set screens, rebounded and scored. And he played with hustle, determination and effectiveness all day long. A really valuable piece to the lineup at Sussex Hamilton. Krueger is a hustle guy all the way. He made plays on both ends of the court while scrapping for loose balls, snaring rebounds, scoring from mid range and in the lane. He also ran the court to deflect passes and play strong defense. Simply put, Krueger competed with tremendous energy throughout the day. A cat-quick lead guard who consistently zoomed past defenders with his shiftiness and quickness, Black made some shots from three-point range and also did a solid job of setting up his teammates for scoring opportunities. A hard worker on both ends of the floor, Black came off the bench as a junior and averaged 6.3 ppg for coach Sam Katula and the Northstars. A constantly moving player who may have led the WSN Showcase in deflections, Bedor needs to add strength and weight to his lanky frame, but there is no denying his ability to get his hands on rebounds and use his quickness to get to the basket. He never seemed to run out of energy and was a factor on offense and defense. As a sophomore, Bedor averaged 9.0 ppg and 4.2 rpg for a Shiocton squad that went 19-6 under coach Chad Schmidt. For the latest and most up to date boys' basketball news and recruiting information, follow Mark on Twitter @wisbbyearbook. Email story ideas, recruiting info, etc. to Mark by clicking here.